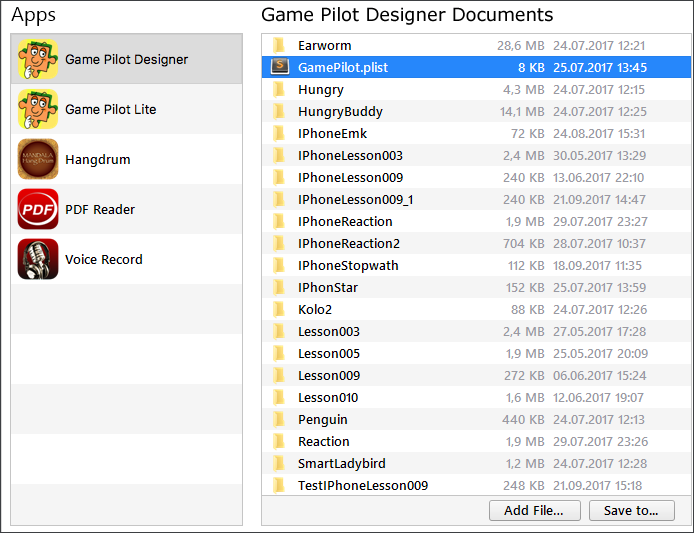 You can transmit project files from Game Pilot to your computer and back using iTunes program. 1. Connect your iPad (iPhone) to your PC or Mac using a USB cable. 2. In iTunes (while writing this tutorial, we uses iTunes 12.7 for Windows), select your device. 3. In the left column, select "File Sharing" (if you use an older version of iTunes, select "Programs"). 4. In the window to the right (in older versions of iTunes you need to go to the bottom), in the Apps column, select Game Pilot. The window with the Game Pilot documents will appear on the right. Each document is a folder. you can select the desired directory and the selected project will be copied to it as a folder. 6. If you created a project folder on Mac or PC, you can copy it to your iPad (iPhone). If you use MacOS X, click the "Add..." button. If you use Windows, press "Shift" on the keyboard (the "Add File...“ button will turn into "Add Folder…" button) and then click "Add Folder ..."
7. Select the project folder. If a folder with such a project already exists, you will be prompted to overwrite the files. 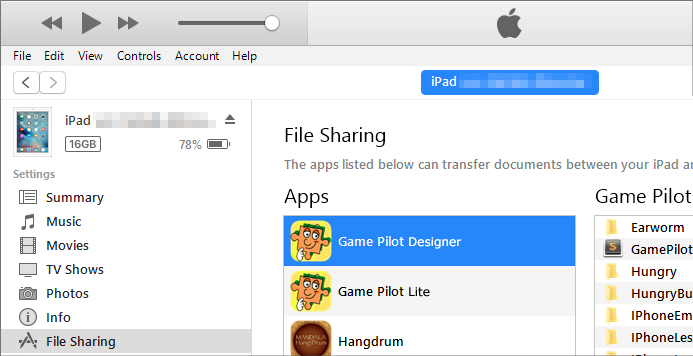 Once the project is copied, without disconnecting the iPad (iPhone), you can start Game Pilot and select the "Locally" mode. The project will appear in the Documents list. The paid version of Game Pilot allows you to transmit project files using FTP as well. You can also copy project files using iTools program. Unlike iTunes, iTools lets you not only copy an entire project folder, but also view particular files in folders and copy them as well.